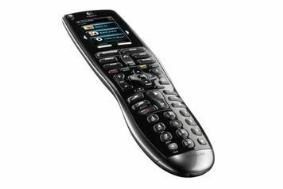 Logitech launches Harmony 900 universal remote | What Hi-Fi? The new RF system allows you to control up to 15 devices from some 30 metres away and through cabinet or AV rack walls. There's no need for a transmitter for each device, rather you need to attach one IR blaster and one or two of the mini blasters near the devices to be controlled. The Harmony 900 can then be programmed to control the necessary devices. As ever, Logitech majors on easy to follow online setup procedures for all your equipment, and activity based controls – so it's just one button press for 'watch TV' or 'play Xbox 360', for example. The Logitech Harmony 900 ships with a a recharging cradle, rechargeable battery, power supply, IR blaster and two mini blasters. It's expected to be available in September and will retail at £299.